We’ve introduced you to Digiarty’s VideoProc app in the past, a powerful Mac and Windows app for easily editing, converting resizing and adjusting 4K UHD video, DVDs and music. 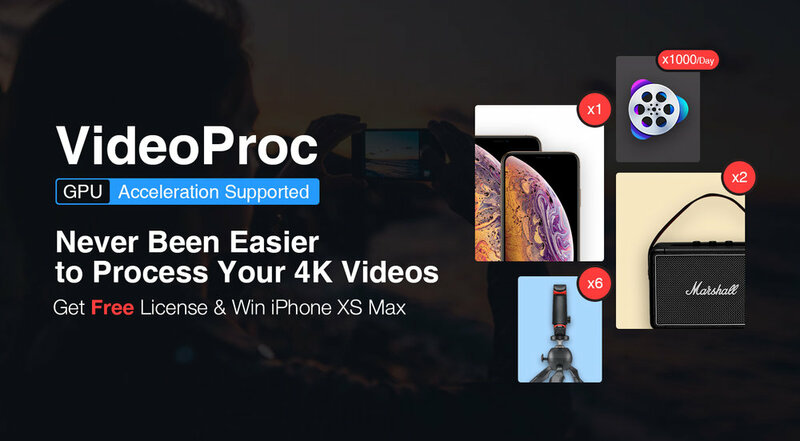 Today we’re going to show you why VideoProc is the best iPhone video converter app on the market today, and give you a chance to win an iPhone XS Max, a Marshall Kilburn II speaker, a Manfrotto PIXI Plus Mini Tripod Kits, and a copy of VideoProc iPhone Video Converter. Have You Experienced One Of These iPhone Video Problems? If you’re like us, you’ve probably run into one of the common issues that can appear when you’re trying to watch video on an iPhone or move it to your desktop or laptop computer. Perhaps you can’t play a video file on your iPhone because the file format isn’t supported by iOS. Maybe you’ve captured a video on the iPhone in the new HEVC format and you’re trying to run it on an older computer. Or you’ve taken video using a drone or action camera and find that it can’t be viewed on your iPhone or iPad because of incompatible formats. You might find that it’s not only video that has issues. Not all music file formats can be played on your iOS devices — we’ve personally found that some music ripped in the early 2000s from CDs can’t be played back on iOS. VideoProc iPhone Video Converter can resolve every one of these common problems. It’s the only Mac and Windows app of its kind that seamlessly and quickly converts video and audio file formats into the optimum formats for iOS. Conversely, if you shoot a lot of HEVC (H.265) video on your iPhone and want to make it available on desktop and laptop platforms in the best possible quality, VideoProc can ensure that your 4K UHD footage is converted quickly. Check out this great tutorial on how to convert the iPhone’s HEVC formatted video to H.264 for easy playback on almost any computer or device. Did You Say Something About a Giveaway and Sweepstakes? Yes, we did! Before we get into the details of how VideoProc works, take a chance at getting some free stuff or maybe winning an iPhone XS Max! Click on this link and you’ll be whisked to a special web page where you can enter to receive a free VideoProc license key and earn an entry into our giveaway. You have until February 20, 2019 to enter, and the prizes are awesome. They include a brand new Apple iPhone XS Max, a Marshall Kilburn II Portable Bluetooth Speaker valued at $299.99, a Manfrotto PIXI Plug Mini Tripod Kit (perfect for taking better photos and video with your iPhone), and VideoProc iPhone Video Converter. Just enter a valid email address on the linked page to earn an entry to the sweepstakes and get a VideoProc license key. In this example, we’ll take some 4K UHD (3840 x 2160 pixel) drone footage that just wouldn’t play properly on iPhone and run it through VideoProc. We’d also like to edit it to make it a bit shorter, improve the color, and then make the file smaller so it’s easy to play on iPhone. To start with, we just dragged the video file to VideoPro iPhone Video Converter and it loaded instantly. To shorten the video from nearly seven minutes down to a more manageable three minutes, we clicked the Cut button under the video listing in VideoProc. Cutting the length of the video was as easy as moving slider knobs to the beginning and end of the video, then clicking the Cut button. When all of our edits were ready to go, we simply clicked the Done button, chose a target format (iPhone H.264), then pressed the RUN button. The conversion was lightning fast thanks to VideoProc’s use of Level-3 GPU hardware acceleration technology, which speeds up video processing while lowering CPU usage. Within a few short minutes, the edited and converted video was ready to load onto the iPhone. The video went from being well over 3 GB in size without a watermark to a much smaller and properly marked file with absolutely no loss of video quality. Once you’ve converted one file, you’ll understand how easy it is to convert videos to any format you need. VideoProc has 420 device-specific profiles that can convert any video to all models of iPhone and iPad, Android, Facebook, and more — usually with one or two clicks. VideoProc can do even more, like providing downloads of videos from thousands of legal sites. If you’ve tried — and failed — at editing videos with other tools, you’ll find VideoProc’s easy user interface makes it simple to cut, crop, merge videos, and even add filters or subtitles with a few clicks. For those who have DVDs they’d like to convert to iPhone or iPad-compatible file formats, VideoProc is just the tool. We’re currently converting our entire DVD library to digital format thanks to VideoProc. Here’s the deal: you can download a free copy of VideoProc at any time and enter the giveaway and sweepstakes. If you like what you find — and you will if you do any work with video — you can get a full lifetime version of VideoProc at 60% off the usual price.